T-L Photo/KIM NORTH SHADYSIDE FIRST baseman Nate Schnegg awaits a pickoff throw as Martins Ferry’s Mason Goddard dives back safely during the first inning Saturday at Fleming Field in Tiger Town. The Tigers won then first game of a doubleheader, 9-1. 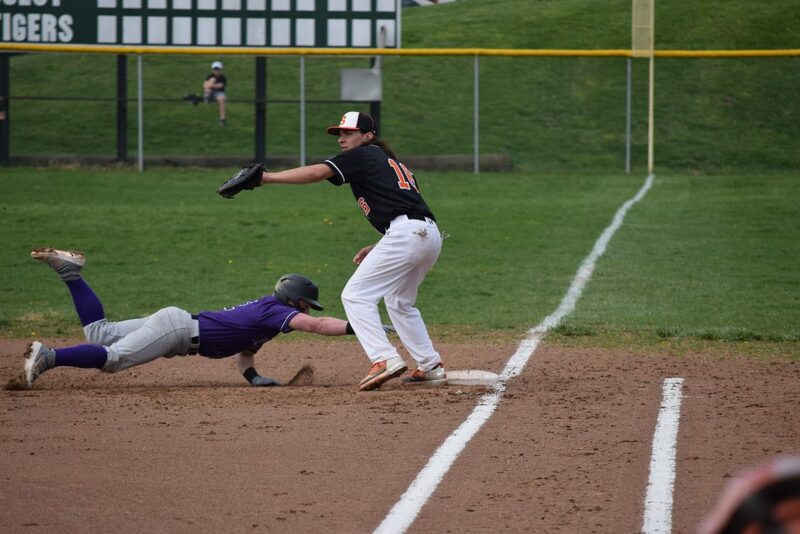 SHADYSIDE — With the cut-off for the OVAC baseball tournament looming Wednesday, Shadyside strengthened its hold on the Class 2A standings with a 9-1 victory over visiting Martins Ferry Saturday afternoon before a nice turnout at Fleming Field. Freshman Korey Beckett scattered three singles and struck out half-a-dozen for the Tigers (11-2) in the first game of a doubleheader. The second game ended after The Times Leader deadline. Complete details can be found in Monday’s edition. Shadyside scored all the runs it would need in its first at-bat when it went ahead 2-0. Collin Holmes reached when his one-out infield popup was dropped. Anthony Coggins, who went 4-for-4, sliced a double down the rightfield line as Holmes chugged into third. Kelly Hendershot’s slow grounder to third allowed Holmes to score as the second out was recorded, but Coggins came home on a Shane Florence single up the middle. Martins Ferry (6-3) sliced the deficit in half in the third when Collin Snedeker scored on the lone error committed by the hosts. The game remained that way as Beckett and the Purple Riders’ Trevor Hanson were settling into grooves. However, Martins Ferry threatened in the fourth when Drake Dobson was tagged out trying to score from third on a wild pitch. Coggins scrambled to the loose ball before flipping a strike to Beckett covering the plate. The batter, Chase Goff, later singled during the at-bat. It was all Beckett from there on. He allowed a harmless two-out single by Chase Ward in the sixth in retiring 10 of the final 11 Purple Riders he faced. He threw 106 pitches, with 66 being strikes. Shadyside blew the game wide-open with three runs in the fifth and four more an inning later. Coggins had an RBI single in the fifth and Frank Ripoly picked up a ribbie with a bases-loaded walk. The other tally came across via an error, one of six that Martins Ferry committed. Coggins finished with two singles, a pair of doubles and two runs batted in. It helps when Coggins has a player like Hendershot batting behind him. Hendershot drove in three runs, two coming on a single in the sixth. Shadyside host Cameron Monday before travelling to New Martinsville Tuesday to meet Magnolia. Martins Ferry, meanwhile, will unveil its newly renovated field on Monday when Harrison Central visits. The Purple Riders begin a home-and-home series with Steubenville Central Catholic on Tuesday at home.